With the world of customs dominated by GMs and Fords, it’s always a nice surprise to see a builder venture outside of the “norm” (yes I know – somewhat of an oxymoron in regards to customs) and build a car from a lesser known and recognized platform. 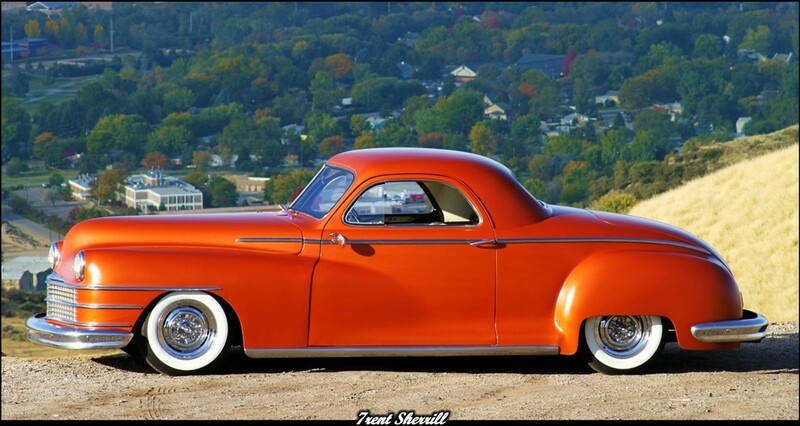 Its even sweeter when the gamble pays off and comes out looking like Phil Bell’s 1947 Chrysler Royal Business Coupe. Back in 2005, Phil put the word out that he was in the market for a late 40’s model Mopar. 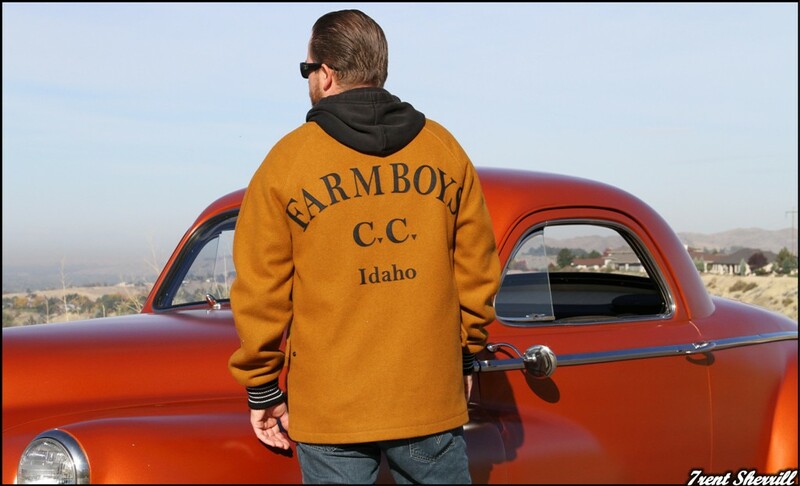 A call soon came in from his friend and fellow Farm Boys C.C. member, Shane Taylor. 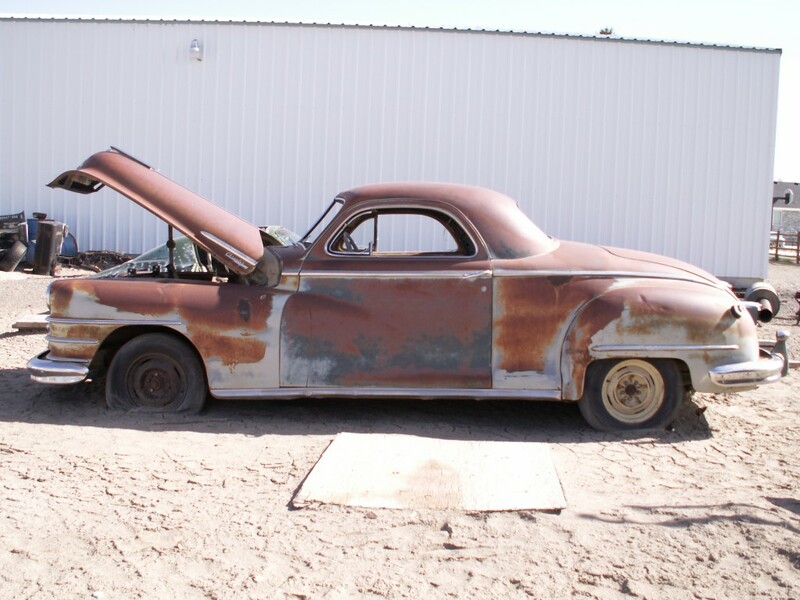 Shane located a 47 Chrysler Royal Business Coupe in Burley, ID that he thought might foot the bill but it would take more than just a general restore – this one needed a resurrection. 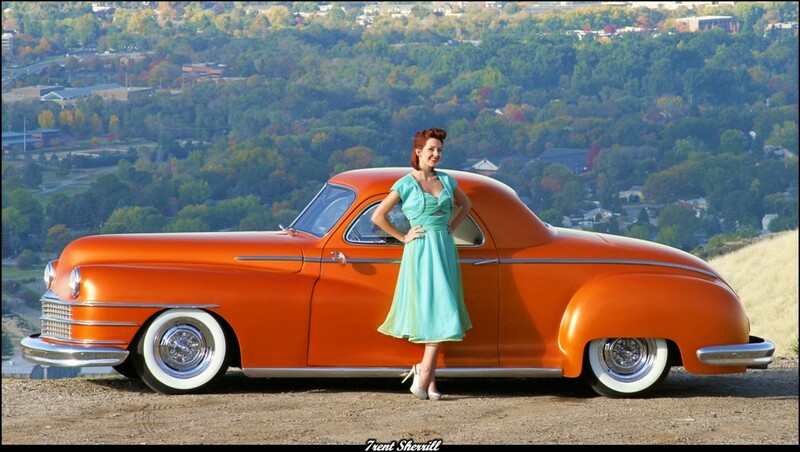 Phil took a look at the car and initially passed, but a year went by and nothing had captured his interest. So he went back in April of 2006 and $800 bucks later, was the proud new owner of a rusted out, windows busted, 47 Coupe that was up to it’s axles in dirt. Since Shane helped find the coupe, it only seemed fitting that he let Phil use a spot in his shop, Wrecked Metals, to begin the resurrection. (Here’s a video introducing Wrecked Metal) So for the next 5 months Phil would leave his day job as a barber and spend the rest of the night at the shop working on the coupe. His buddy Matt Whitlock chipped in on the body work, helping mold in the fenders as well as with nosing the decking the coupe. A Camaro clip was welded in up front which offer performance upgrades such as power steering and disc brakes. Phil’s coupe rolls on 15” reverse O.E.’s from Wheel Vintiques with Coker bias ply wide whites. The lowered stance is achieved through de-arched leaf springs in the rear and up front a coil and a half were cut from the factory springs. Suspension upgrades are on deck for future modifications to the coupe including a 4-link in the rear with coilovers at all four corners. 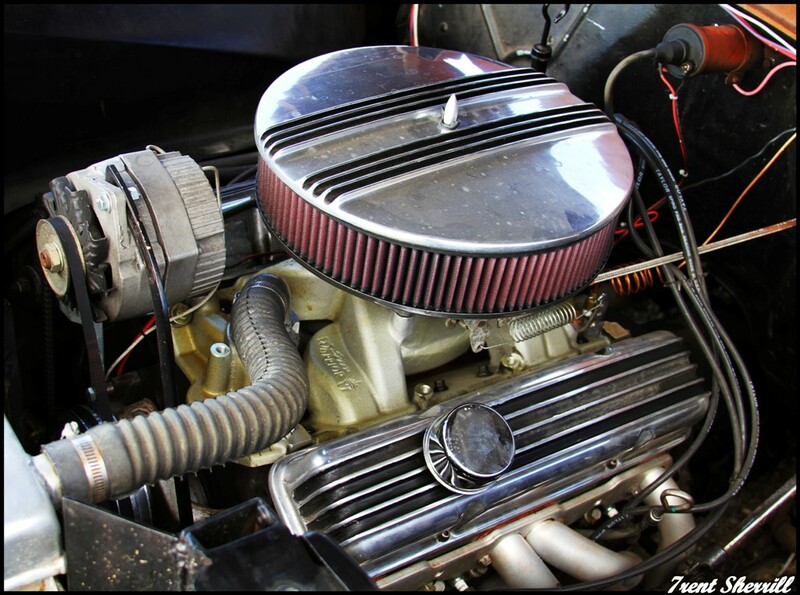 Where the original 251 “L-head” flathead six once resided the modern staple of performance, the small block Chevy, now lives except Phil wasn’t content with just a general run of the mill 350. So he stroked the SBC to 383ci with a Comp Cam and Weiand intake manifold topped off with and Edelbrock 4bbl. A TH400 handles the built small blocks power and since Phil and his Chrysler have made several long haul trips to California, Bonneville, and Washington, 2.73 highway gears fill the Camaro rear-end to keep the MPG’s in check. Although more revered for its reliability and durability, the Chrysler’s “L-head” made a period respectable 114hp and 204lbs/ft at just 1200rpm. The subtle touches to the interior keep the traditional theme. White tuck and roll patterns with black trim courtesy of Sean Rodgers line the cabin. 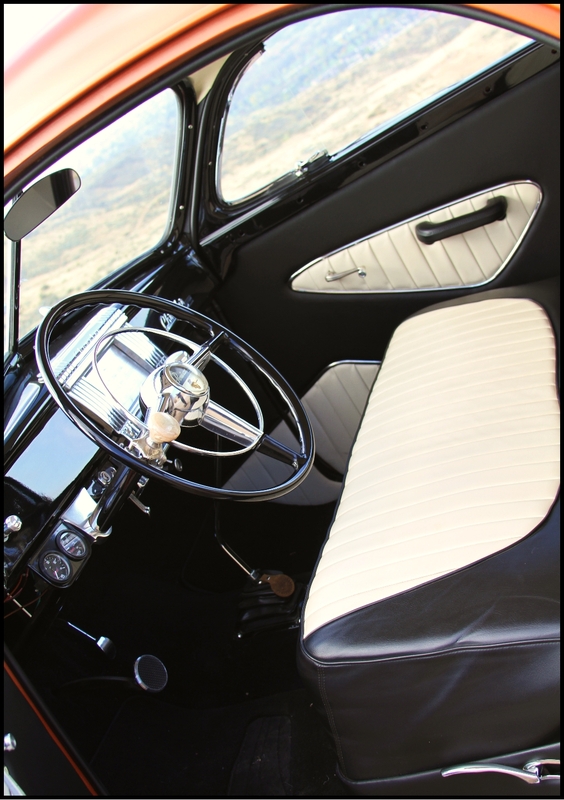 Instead of taking the knock-off repo or street rod route, Phil put in some legwork and tracked down a Pontiac Chieftan steering wheel from Vintage Auto salvage yard in Mountain Home, ID that adds true 50’s custom styling to the interior. The chrome spear running nearly the length of the Chrysler added a smooth flush look from the factory so Phil opted to retain the spear and the door handles. Outback the “fatback” rear has been decked, the taillights frenched and Phil added a good dose of pinstriping. 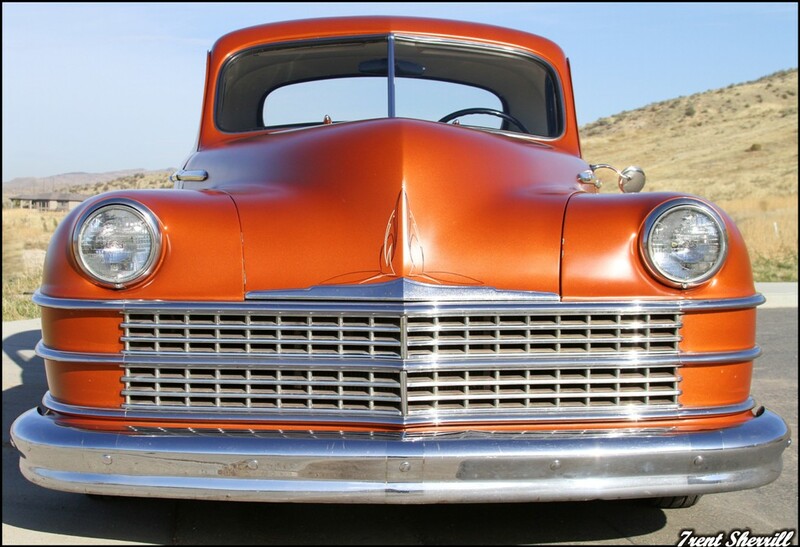 The front was nosed and all badges were shaved creating smooth lines at all corners of the Plymouth. 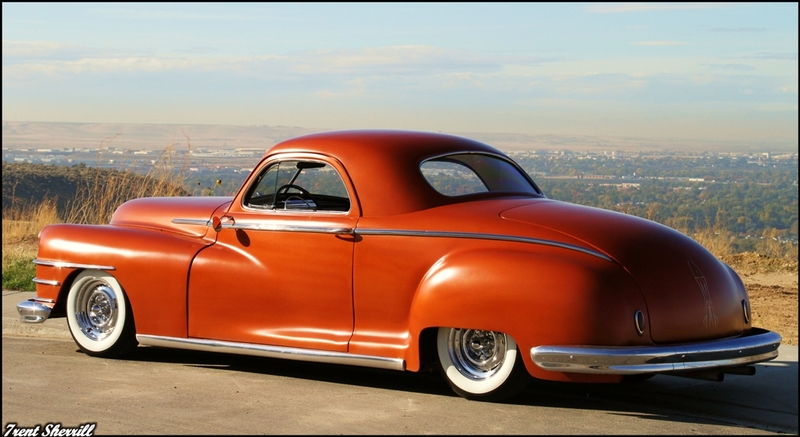 Phil selected Copper Pearl with a satin finish to shoot the revamped coupe with, and just as with every other stage of the coupe, Phil loaded the paint guns and sprayed it himself. 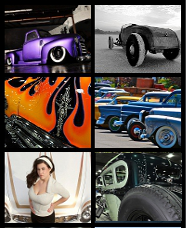 In speaking with Phil he’s quick to point out he could not have built this rare traditional kustom without the help of his brothers from the Farm Boys C.C. Although it’s a smaller club, it’s a tight group of friends that lends their respective skill set when needed. And if you know a little about the history of the culture – that’s exactly how it all started. 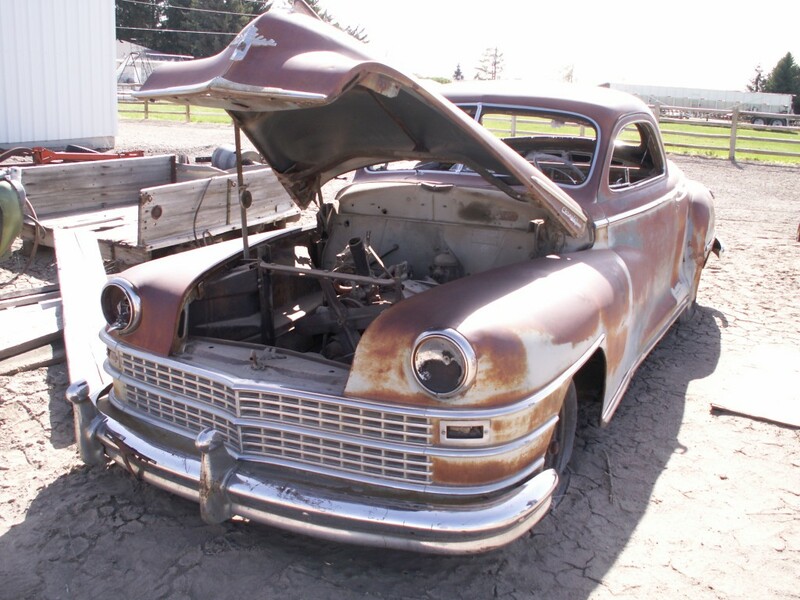 For a quick look at what $800 buys in the form of a 1947 vintage tin, here’s the Chrysler Royal when Phil picked it up. You gotta have vision! HA!! That shoulda been the title of the story!! As a Mopar Guy, I love man!